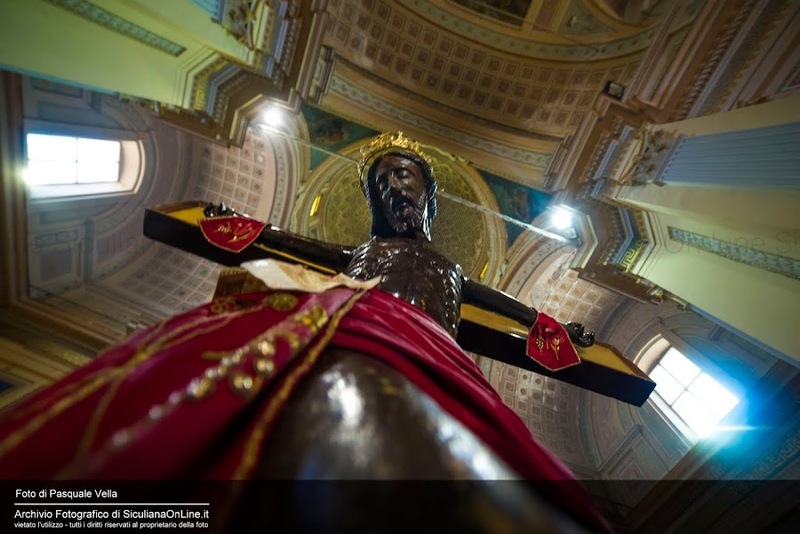 The statue if the Holy Crucifix (or SS. Crocifisso) is a dark brown varnished sculpture in oak, representing the dying Christ's last breath. The pure lines of the sad, serene and imposing face, evoke revered fear. The body's weight rest solely on the bent knees. The statue seems to be breaking off from the cross and leaning forward towards the unlooker. Bishop Mons. Rhini of Agrigento, with the Bull February 14th, 1681, established the brotherhood of the SS. Crocifisso in the Mother Church. On that day, the Brothers received the statue, believed to be miraculous as a gift from the Confraternity of SS. Sacrament, who were the old owners. Consequently, the statue must have been produced not later than the 16th century, although we could be dealing with a work of art of the 13th century or even prior. Some believe it to be Byzantine which, for centuries, remained amongst the rubble of the old castle in Siculiana. Popular tradition holds that the statue of the SS. Crocifisso, on its way to the village of Burgio, turned up in Siculiana, where the carriers who were transporting it made a stop at an inn the nearby Chiaramonte hamlet. It so happened that a blind person (or a lame person) sat on the chest containing the statue, and soon was cured. The people of Siculiana, astonished by the event and fully aware of the contents of the chest, and not wishing it to reach its destination, carried it to the castle. A dispute arose with the people of Burgio who claimed its ownership and so it was decided to hold a sort of a contest. If the wagon carrying the chest, pulled by oxen would cross the stream near the town, Burgio would be judged the winner, if not, Siculiana. The oxen did not cross the stream and so the Crucifix remained in Siculiana. Fearing it could be stolen by the people of Burgio or by Arab pirates, the statue was up walled up for the entire year within the chapel of the castle. By the beginning of the 17th century, the SS. Crocifisso was moved to the mother church and arranged in the side chapel next to the Baptistery. When in 1813 the work of extension was completed, the statue was placed on the high altar in the apse where it is preserved today. Concerning the SS. Crocifisso, there is an ancient custom: "la caduta del velo" (the removal of the veil) covering the face of Christ. For the faithfuls it is a very evocative moment and one of great devotion whose occasion is solemnly celebrated on May the 2nd. This ritual, commencing with the hymn "Praise to you o Crucifix", commemorates the removal of the wall which historically preserved the statue within the Chiaramonte fortress. The statue was then brought back to light and displayed the day before the feast. All the faithfuls would then get ready for the big day of the grace the next day with a solemn feast on May the 3rd. It is part of the tradition even today to carry the statue in procession every 3rd of May through via Castello and up to the entrance of medieval manor. Many prodigious manifestations have been attributed to the story of the SS. Crocifisso especially the ones of 1843 and 1897, when during the procession the chest underwent unexplainable and irrational behavior. An elaborate stand was built for the chest, but because of its great mass, making it hard to carry was stored in the Baptistery chapel. It was such a special privilege to be a carrier of the statue that a father would leave in his will this precious right to his son. On the 3rd of May 1939, Mons. Giovanni Battista Peruzzo came to Siculiana to crown, in piazza Umberto I, the Crocifisso with a crown of gold offered by the devotee. On the 50th Anniversary, the event was remembered with every solemnity on May the 3rd 1989 in the presence of the Bishop of Agrigento, Mons. Carmelo Ferraro. A devotional cult practice, typical of the SS. Crocifisso, is the penitential pilgrimage as far as the foot of the statue, often in bare feet, made by Siculianesi and by the multitude of worshipers coming from everywhere, especially during the feast.